While the Nasdaq has fallen rather sharply lately, its still stronger than the NYSE composite based on 10-week relative strength. As I’ve discussed in the past, Nasdaq relative strength over the NYSE has generally been a positive for the market. I figured I’d look at this in the context of the recent selloff as well. Glaring about this study is the low number of trades. This speaks to the relatively unusual market environment. While the 5 instances were somewhat mixed over the short-term, performance once you got out 13 weeks was strongly positive. For those interested, the trigger dates were 12/6/74, 8/8/75, 8/14/98, 8/6/99, and 7/19/02. ’74 and ’02 basically marked the bottoms. The other instances did some wiggling around before moving smartly higher. Not nearly as positive at the steeper 9% decline, but still very good on a risk/reward basis when looking out 10-20 weeks. Nothing here that appears to be immediately actionable on its own, but as long as the Nasdaq can hold on to its leadership spot, the market stands a pretty good chance of putting in some intermediate-term gains. Does A Lackadaisical Put/Call Keep The Market From Bouncing? This first one I looked at both above and below the 200-day moving average, and it made little difference. The implication of the Put/Call tests seems to be that a relatively low Put/Call doesn’t hurt the chance of a nice bounce. This was a bit surprising. Also a bit encouraging. Last week I discussed why and how I sometimes use options for short-term trades. Today I will expand on that with some rules I follow and other thoughts. If you didn’t catch last week’s post, you may want to check that out first. How do I decide whether an option is preferable to the stock? 1) The stock should trade for at least $25 or more. The higher the better. I especially like stocks in the $40-$80 range. – The spread on many deep options is $0.10. Sometimes you’ll find something appropriate with a $0.05 spread, but not always. In many cases you can assume you will lose at least most of the spread on the trade. If I’m looking for a 2-3% move I don’t want to give away $0.10-$0.15 on a $15 stock. Doing that may destroy my edge. With low priced stocks I normally just buy the stock. 2) The option should have almost no premium – Even with higher priced stocks, I don’t want to pay much premium on the option. More than $0.15 or $0.20 and I begin to lose some interest. In low-volatility environments this is easily accomplished. During panic situations when the VIX spikes you’ll be hard pressed to find anything trading without a decent amount of premium. 3) I want enough time for the trade to work, but not too much time left on the option – The contracts are generally monthly. My trades average about 1 week. Two weeks to expiration is the sweet spot. Less than one week and I’m normally looking out to the next month (which means additional premium). Three weeks or longer and your going to have to pay for some time value. If the trade works quickly then you may be able to sell the option with time value left in it. There will be some erosion, though. 4) The delta should be 90 or higher – This is normally the case if you’re not paying much premium for a deep option. Basically, I want the price to move up very close to the same amount as the stock price. What if the exit trigger doesn’t arrive before the option expires? In this case some decisions need to be made. If I’m trading a stock then I’m normally not trading a size larger than I would trade if I owned the stock anyway. Therefore, taking delivery of the stock is an option. If it is index shares that I’m leveraged with, then I need to roll them out to the next month. Rolling out to the next month adds some cost. First, you have basic transaction costs since you are selling your options and buying others. Frequently more significant is the premium cost. You are selling an option with 0 premium and buying one with some premium. To help reduce the amount of premium the roll will cost you, a spread trade normally helps. Rather than entering a sell for X contracts and then a buy for X contracts, put it in as a spread trade. Even though the option may trade with a $0.10 spread, you can enter spread trades to the penny. When else might it be appropriate to switch option contracts? If the trade goes sharply against you and you still feel positive about the position you could consider moving to a lower strike price (assuming long call). Two things will happen when your stock price rapidly approaches your strike price. 1) Premium may get built into the option since you are now near or at the money rather than deep into it. 2) The increase in premium will also mean a decrease in delta. So when the stock does bounce your option initially may go up $0.75 for every dollar rather than the $0.95 for every dollar that it would have when you bought it. Therefore, one strategy to consider would be to sell the now “near the money” option you hold and buy a deep one. This accomplishes two things: 1) You are able to make money on the premium that was just built up and 2) You own an option with a higher delta that will rise faster than your original option. Of course there is a big disadvantage to doing this, and that is that you are now laying out more capital. Part of the reason for using options is to control risk. Swapping out for deeper ones when the trade goes against you increases your initial risk, so it’s something that needs to be carefully thought through before doing it. For index trades, why use options instead of futures? There are advantages and disadvantages to both. Some advantages for options include: 1) They can be traded in the same account as stocks. No need to segregate to a futures account. 2) In low volatility environments, you can actually get more leveraged than with futures. A big disadvantage rears its head in high volatility environments. When the market sells off hard and volatility spikes, even fairly deep index options carry a decent amount of premium. With futures this is not as much of an issue. In Gerald Appel’s book, “Technical Analysis – Power Tools For Active Investors” he discussed a breadth measure he uses to anticipate market rallies. Bascially, he takes a 10-day Exponential Moving Average of the NYSE advancing issues divided by the advancers + the decliners. In the book he discusses a system where a strong thrust upwards in this indicator frequently leads to rallies. I have found that strong downward moves also tend to lead to rallies. While the indicator has not always worked, it has done a nice job over the last 25 years or so. It could also be used as a system parameter for a trade exit. Below I show the results of entering an index position when the indicator drops below 0.375 and then selling when it moves back above a certain number. Results here are from the 1982 – present period and are quite robust. As in the Nasdaq study, WR7 down – NR7 implications appear bullish. Both studies seem to suggest the same thing. When a substantial selloff (measured in either price or volume) rapidly loses steam, the result is typically a bounce back up. Also notable is the fact that the CBI hit “8” today. To see recently reported results following moves to 7 or higher, see the June 11th blog. On the negative side, the VIX didn’t budge, the Put/Call ratio dropped precipitously, and it looks like another possible case of Draggin’ Breadth today. Lastly, while the studies help to construct a market bias, the biggest mover in the next few days may be the Fed. Right now, that seems to be a wild card that could spark a move in either direction. Negative results on a fairly low number of trades. Interesting was the fact that most of the winners occurred in the early ‘90’s. The table below shows the results of the above test from 1993 – present. The number of trades here is quite low, so it’s dangerous to read too much into it, but the implication appears to be negative. While the market is oversold, the Capitulative Breadth Indicator is back to 5, and a sharp bounce could ensue at any time, we may need to see a little more fear before it happens. The January study showed a clear edge to the upside from an average trade standpoint. That edge disappears when the reversal is weak. Doesn’t look like Thursday’s action is anything to get to hyped about. One statistic I look at and use in my trading is the amount of time a security trades above or below certain moving averages. One moving average I look at is the 10-day moving average. Right now there are 4 stocks in the S&P 100 that have closed below their 10-day moving average for at least 30 days in a row. They are BAC, RF, GM and WB. Using the current S&P 100, I ran some scans back over the last 10 years to find out how unusual this is. In the last 10 years there have been only 65 occurrences of an S&P 100 stock closing below its 10-day moving average for 30 days in a row. Twice there have been 4 or more on at once. The first time was in late August of 1998 when there was up to 5 and the 2nd time was early March of 2000 with 4. From a historical perspective, some of the recent selling, especially in banks and financials, has been persistent to a degree that has rarely been seen. Options For Short-Term Trading - Why And How I Do It. 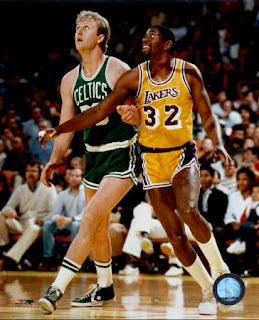 So the Celtics-Lakers series is back in town. Therefore, no research tonight as I’ll be at the game. (I’m the guy in the upper deck with the green shirt and black and green hat in case you see me on TV.) Instead, I’ve decided to prepare a little write-up on options trading. As most readers are likely aware, much of my trading is focused on a swing trading timeframe. Most of this focuses on large-cap stocks and highly liquid ETF’s. With these positions, instead of trading the stocks or etf’s, I will many times trade the options. There are two main reasons for this: 1) Risk control and 2) Leverage. Several of the short-term reversal systems I trade don’t involve stops. An example of one of these systems can be found here. This means two things. 1) If I take a large position and the trade goes against me I may be tying up the capital for longer than I would like and 2) If disaster strikes (think Bear Stearns – and no I didn’t trade it) my position could get wiped out. Who knows where the next 90% drop is lurking? By using options I an able to solve both of these issues. First, even when buying deep in the money calls, the outlay is significantly less that purchasing the stock. Second, they provide a “natural stop” for the trade (they’ll only drop to zero). I’ll use a recent Subscriber Letter trade as an example. Bank of America (BAC) was scaled into last week and the exit trigger occurred this morning. For my own accounts, I did not purchase any BAC. Instead I bought the June 25 calls. They cost me about 15% of what I would have spent to buy the stock. So if I wanted exposure to $100,000 worth of BAC, I instead would buy about $15,000 worth of BACFE. It's fairly deep and trades with little premium and a delta of nearly 1. If it goes up, I make nearly the same dollar for dollar. If it goes down, I can't lose more than $15,000 (unless I roll to another option). To put it another way, if you can get a deep call like this for 15% of the price of the stock, then you can effectively get a 10% position with an account risk of 1.5% (option goes to zero). Also, depending on how the drop occurs, premium may get built into the option, so I may not lose as much as I would have on the stock purchase. With individual stocks, rarely will I take more exposure than I would if I were simply buying the stock. I don’t normally do it for leverage. I do it to control risk. Index trades are a different story. Here I will many times look for leverage. The execution is generally the same, though. The S&P 500 is the index I trade the most and I normally do it with SPY options. As I look at my screen while I’m typing this the SPY is trading at $135.73 and the June 129 calls expiring in 3 days (SPYFY) are at $6.80. Only about $0.07 premium. The 129 calls with 12 days (RQQFY) left have about $0.15 premium in them. Either way the premium is quite small. If I want to get leveraged I can lay out about 15% of my capital and have 300% exposure to SPY. ($6.80 * 3 = $20.4 / $135.73 = 15%). So that’s the general concept of how deep in the money options can be used to control risk and/or gain leverage. If you’re not familiar with trading options then it’s just enough to make you dangerous. I’ll try and follow-up in the next few days with some guidelines I use when considering these kind of deep options plays. For those who would like to read more and gain another perspective on this type of option trade, check out Steven Gabriel’s write-up from a few years back. The S&P 500 rose today for the 3rd day in a row. As I showed on May 30th, when the S&P is trading below its 200-day moving average and without the proper pattern of increasing volume, this has provided a short-run negative expectancy over the last 35 years. What was interesting about today’s rise is that it was so weak from a price perspective. This can be a sign that the bulls are losing momentum and the short-term tide is ready to turn back to the bears. Below I show the results of buying at the close on a day where the S&P is below its 200-day moving average, has risen at least 3 days in a row and today’s rise in the smallest in percentage terms of any day during the rise. Also notable from today is that the Capitulative Breadth Indicator (CBI) returned to “3”. This is what I consider a neutral state. In other words, it is no longer suggesting an upside edge. For those keeping score, the “buy at 7 – sell at 3 or lower” trade would have netted about 2 S&P points from the “7” signal on the 10th to the close today. On Friday the market put in some solid gains. The S&P 500 rose 1.5%, the Dow 1.4% and the Nasdaq 2.1%. In Gary Smith’s 1999 book, “How I Trade For A Living”, Gary, pictured at the right*, discussed how strong momentum on Fridays has a tendency to carry over to Mondays. If you’ve read the blog for any period of time, you’ll know that I tend to believe very little of what I read about the market. Hence my desire to test everything. So I put Gary’s theory to the test. Tests were run on the S&P 500 going back to 1960. The table below shows the percent return on Friday in the left–most column. After that you see the breakdown of what happened on Monday. (Buying Friday’s close and selling Monday’s close.) Also, you should note that if Monday was a holiday, then the sale occurred on Tuesday’s close. Looks like Gary (pictured above)* was on to something. Especially interesting is the fact that the stronger Friday is, the stronger on average Monday is. You can see this by looking at the average trade column. But with the long term upward drift of the stock market how have these Mondays compared to the average Mondays? Believe it or not, Mondays since 1960 have been horrible. During the 60’s, 70’s, and 80’s, Mondays were consistent losers for the stock market. After the crash of ’87 (which happened on a Monday), they no longer acted as a consistent loser. Instead they fell more in line with general market direction. This can clearly be seen in the graph below showing all which shows the result of purchasing at Friday’s close and selling at Monday’s close over the last 48 years or so. For the entire 48 year period the average Monday lost 0.04%. But when Friday’s were strong that momentum tended to carry through and turn Mondays positive. Since the end of the 80’s the advantage has been less pronounced, but still exists. The last table below again shows Mondays returns based on Fridays returns, but this time only back to 1990. * Not really Gary Smith. Actually that’s Spongebob Squarepant’s pet, Gary the Snail. Just time for a quick post tonight. After gapping up about 0.5% on Thursday the market failed to make much headway. Around 3pm the gap was closed. A late rally left the market slightly positive on the day. This action is fairly typical of how the market reacts to mid-sized gaps in downtrends. It’s the big gaps that frequently lead to short-covering rallies and strong moves. With volatility picking back up and the fear seeming to climb we may be seeing more in the way of gaps in the next few days and weeks. You may want to review some of the gap studies to see how the market has performed in the past following certain gap situations. The CBI didn’t move today. The way things are set up it could go either way tomorrow. A strong up day may reduce it and a strong down day could get it to “10”. Keep a special eye on the financial sector. For those wondering, the McClellan Oscillator finished around -175. I will make a note of it when it closes above zero, which would signal an exit to last night's "system". The McClellan Oscillator is a measure of breadth developed by Sherman and Marian McClellan. If you are not familiar with the McClellan Oscillator I would suggest you familiarize yourself with it, as it can be quite valuable in assessing the market. Here is a link to the McClellan’s website. In general, strong breadth numbers (NYSE advancing issues minus declining issues) cause the oscillator to rise, and weak breadth numbers cause it to fall. A good portion of the time you’ll find the oscillator value to lie between -100 and +100. As with most breadth and volume indicators, the value for the McClellan Oscillator varies a bit depending on your data provider. For instance, tonight the reading on the McClellan’s website was about -245, Tradestation was showing -240, and Worden Bros. TC2000 was showing -204. Since I was encountering some issues with the Tradestation data and don’t currently have the McClellan’s official historical database, I used the TC2000 data for tonight’s testing. TC2000 users may find it listed as T2106 on their symbol list. In general, the data provider doesn’t normally matter as long as you are consistent in your testing. The data goes back to 1986. Sixteen for seventeen 11 and 12 days out. High average trade. This appears to provide a quantifiable edge. For the next test I devised a strategy that would buy when the oscillator dropped below -200 and then sell when it moved back above zero. Below is a screenshot of the performance report for this strategy. Seventeen for seventeen with an average profit of 3.25% and an average holding period of 8 days. The CBI isn’t the only breadth indicator suggesting an edge to the long side. The Capitulative Breadth Indicator (CBI) edged up to “7” today. As I’ve discussed many time in the past, this is a level where I typically begin to take on long index exposure. Below is a strategy report of the standard entry/exit technique I’ve discussed before of buying the S&P 500 when it hits “7” or higher and then exiting on a drop to “3” or lower. Under normal circumstances a bounce would likely arrive in the next few days. The question is whether this is one of those times where things are a little different and become a lot scarier – like August of 1998, September of 2001 or July of 2002. In cases like those you’d prefer not to get “all in” too soon. All hypothetical trades in the below report were done with $100,000. Looking at the price changes in the major indices it might appear that Monday was a quiet day with little out of the ordinary. In fact, the higher closes in the S&P 500 and Dow masked some substantial selling that took place. Breadth was strongly negative on the NYSE, both in terms of advancers vs. decliners and in terms of up volume vs. down volume. In fact up volume was nearly doubled by down volume. It made up less that 35% of the total of the two. I looked back to 1970 to see other times when up volume was less than 35% of up plus down volume while the S&P 500 closed positive on the day. I was fairly surprised to find only 4 other cases. They were 3/27/80, 1/25/82, 10/4/94, and 3/23/05. To see what poor breadth on an up day may suggest I then loosened the requirements some. In this case I changed the requirement from 35% up volume to 45% or lower up volume. Below is a summary of the results. It appears that the weakness in the broad market tends to act as a drag on the S&P over the subsequent two weeks. Whatever was holding the S&P 500 up in the face of the instance-day weakness eventually ends up falling as well. On another note, the CBI moved up to “6” today. Any higher and we’ll be at levels where I normally being scaling into long index positions. 1) Brian C., sent me a study he did on VIX spikes hitting extreme levels. On Friday the VXO closed over 20% above its 10ma. I looked at this in a study and compared my results to his. They both said pretty much the same thing. More often than not the VXO spike leads to an S&P bounce fairly quickly. Those times that it doesn’t - watch out. 2) I looked back in history to find all the times when the S&P 500 gained at least 2% in one day and then lost all of its gains and more the next day - similar to this Thursday and Friday. No need for an elaborate display of the results here. It only happened once - March 24, 2003. In other words, 2% rises are simply not supposed to get wiped away in one day. There is no reliable precedent for what happens next. 3) The CBI didn’t budge and remains at “3”. This indicator remains neutral. In a market that is selling off in an unprecedented way I’d be more comfortable taking a shot on the long side if this was spiking. Perhaps with a few more days of selling, but right now I’m not seeing anything that is screaming buy. No time for research tonight. I spent the night at the Garden. Yeah Celts. In lieu of a study, I instead prepared a chart of the CBOE Total Put/Call Ratio. One thing traders need to keep in mind when looking at certain indicators is that they may change over time. The put/call ratio is a prime example of that. The chart below is weekly. 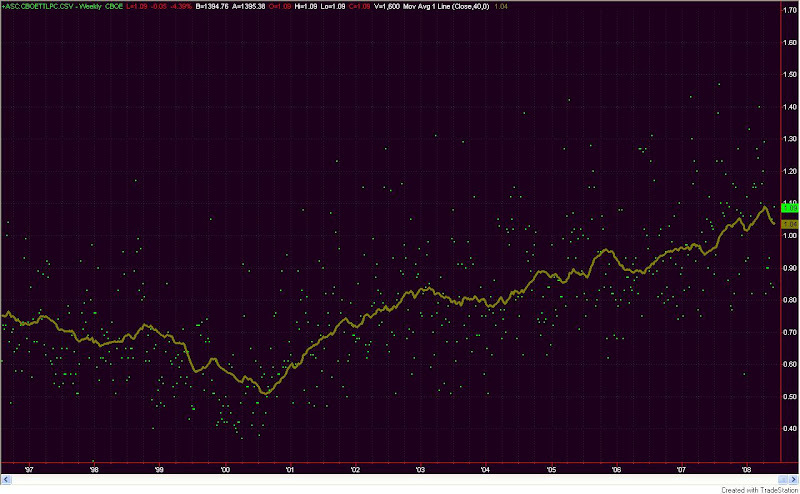 The green dots are the Friday closing prices of the put/call ratio and the brown line is a 40-week moving average. Often times I hear traders refer to absolute levels in put/call ratios as if they are significant. What you can see by looking at the chart above is that “significant” has change over time. From ’97 to ’02 a “spike” in the ratio over 1.00 could have been viewed as significant. A trader seeing such a reading may conclude that fear among option traders was running high. Now a reading of 1.00 is below average. A reading of 0.5 would sure be significant, though. In 2000 it was about average. Strategies that may have been developed 7 or 8 years ago that looked for a move to a certain number are now likely obsolete. That doesn’t mean the put/call ratio has stopped working as an indicator, though. The issue lies in the fact that the popularity and use of options for traders and institutions has changed over time. It will continue to change. To adjust for this you should normalize the readings over a certain time period and then compare the current readings to “normal”. There are a number of ways to do this. Comparing to a moving average using percentages is a simple and effective one. Another way to normalize the put/call ratios would be to use Bollinger Bands (try varying lengths). The specific method is not terribly important. The fact that it is done is important if you don’t want your strategy or study to become obsolete. Additionally, about 86% of these instances closed higher than the trigger day close sometime in the next week. You may also notice that some sentiment gauges like the put/call ratio and the VIX have spiked a bit in the last few days. Traders seem to be getting a bit jumpy. Compare this week’s selloff to the one two weeks ago and you’ll see the indicators spiking just as sharply or more so even though this selloff is more benign. That is generally a good thing. Most everything I’ve been looking at since Monday says we are likely to bounce. There seem to be a few wildcards to keep in mind, though. The banks are one. They need to halt their freefall. Friday’s unemployment report is another. Markets tend to react to that report more severely than most. After shooting higher to begin the month the previous few months, the market decided to throw a curveball in June. These first two days have been a fairly rough start. I decided to see how SPY has historically reacted when the month got off to a bad start. For purposes of the test I shall define “bad start” as a down close the first 2 days and a loss of at least 1.5% over those two days. Also notable is the fact that all 14 closed higher than the trigger day at some point over the next week. Tough to put too much stock in a seasonal-type study like this one. (They are my least favorite from a trading perspective.) Still, combined with some other positives I’m seeing, such as last night’s breadth study and last week’s volume study, I’m inclined to believe we may see some upside sometime in the next few days. The market sold off fairly hard on Monday with decliners swamping advancers by more than 2 to 1. Volume was light, though. From the Crash of ’87 until today they look like this. Buying and holding for a week after such a day would have been a winning strategy every year since 1987 except in 2006. Prior to that – consistent loser. In case you're wondering, using lower volume as a filter improved results slightly. I’m not sure why the change. Perhaps the Crash changed the psyche of the market. 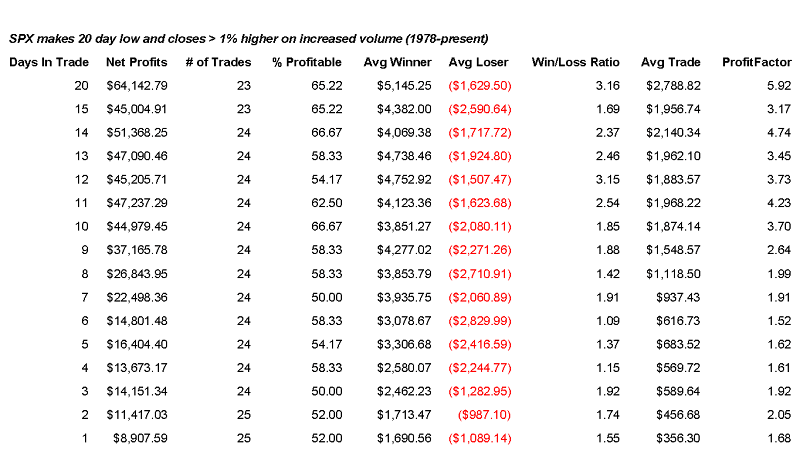 Traders may have decided if it could bounced back from that, it could bounce back from anything – and so dip buying became fashionable and profitable. Whatever the reason, since 1987 days like Monday have fairly consistently provided an upside edge over the next couple of weeks. And speaking of 1987…they’re baaaaack! Not the most bearish study I've ever seen, but it hints that the market may struggle to add to its gains over the next 2-4 days. I'm seeing some warning signs that the going could be tough here very near-term. Caution may be warranted. Friday also posted an "inside day". If you'd like to review possibe implications of this, you may want to check out the old inside days studies.